When Mary Shepherd parked her home (a van) on a street in a trendy part of London no-one knew what to expect. She was cranky, smelly, infuriating and gloriously indomitable. The neighbours complained — but one took a particular interest and invited her to move her van onto his driveway where she remained for 15 years until her death in 1989. That neighbour was the renowned playwright Alan Bennett. 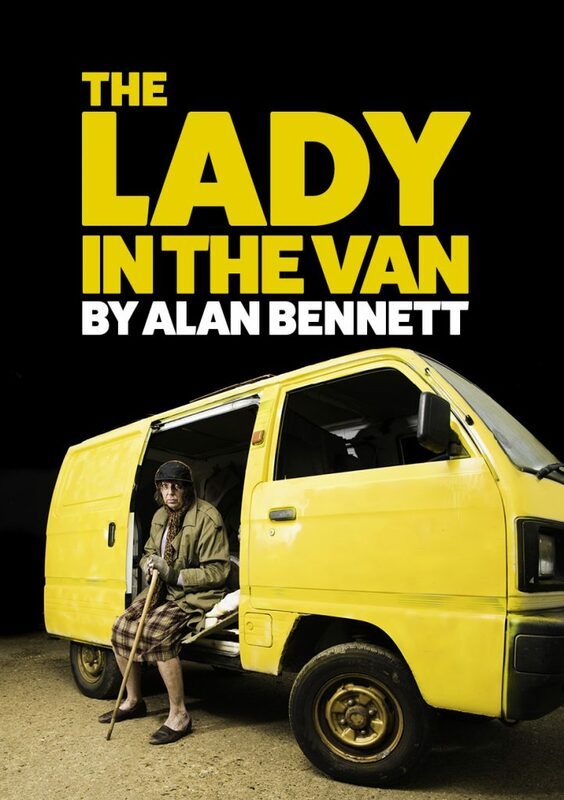 Guildburys production of this iconic play was innovative, adventurous and full of comedy with outstanding performances and a star in the shape of a real yellow van in all her glory. ‘The production was a shining example of the quality of British amateur theatre, and director Eddie Woolrich and all the cast and crew deserve to feel proud of it. The gales of delighted laughter all through the show, and the heartfelt cheers afterward, show how well it came across. I felt privileged to have been invited to share the experience and I’m very glad I went.When Diane Nichols began her ‘farewell’ soliloquy towards the end of the show there was no coughing. There was only the intense silence of an audience taken out of themselves and into complete sympathy with a not-very-likeable character. You could have heard a gnat cough. It was truly moving and a fitting climax to a treat of an evening…….I felt privileged to have been invited to share the experience. The older Bennett was played by Andy Wiggins, also captivating in word and gesture, bringing a finger to the lip and tilt to the hip worthy of the most subtle and adroit of professional actors. “Diane Nichols made the part of Miss Shepherd entirely her own.” ….. “How the Guildburys managed to find a) two such look-alike actors, b) two who were able to be TOTALLY Alan Bennett, accent, voice intonation, gestures, facial expressions, c) two who had the timing just right, well that was also amazing. Excellent performances both.”…. A superb, evocative set used photos of North London scenes to denote Alan’s street, and of sofas etc to denote his house. Otherwise a desk, 2 chairs and a rather important waste paper bin did the rest. Simple, so effective, leaving plenty of space for the Van and room to move around it. …..There was so much here. And pots and pots of crushed mimosa yellow paint, sploshed on the van at regular intervals by Miss Shepherd! How sad the team will doubtless be to say goodbye to her! A wonderful evening I would like to repeat. Luckily I have the short-story version at home, so I will be able to relive the play as I read that. Thank you, Guildburys! ‘The Lady in the Van, aka Mary Shepherd, capably played by Diane Nichols, was full of bravado, and yet, at times came across as vulnerable that you couldn’t help but be sorry for her….. This part, was truly the heaviest undertaking by a single actor… while there was a large amount of pathos about during the evening, there were also times of hilarity. This is not a tragedy to be avoided, but a slice of life to be savoured. The play splits Alan Bennett in two – yes, quite literally. Two actors, Maxwell Hayes and Andy Wiggins have the task of relaying the complete personality of Alan to the audience…. when I closed my eyes during one of their interactions, I did feel that they were as one. Alan’s neighbours, Pauline (played by Gilly Fick) and Rufus, (read by Graham Russell-Price), started the play by wanting rid of Miss Shepherd. By the play’s end, they had come round to the idea of having her as a neighbour. Graham took over the part which was to have been played by Kim Ferguson, who had to withdraw just before curtain up last night. For all that he was reading, Graham quickly made us treat his script as a piece of stage furniture. The parts of Alan’s mam and Miss Shepherd’s sister were played by Barbara Tresidder. Small parts, but necessary to the viewer’s understanding of the play as a whole, Barbara was believable in both roles. Graphic design Phill Griffith. Production Photography Kevin Malam.